B y the 19th Century there was a diversity of heating systems ranging from the simplicity of the traditional brick open stove to elaborate and high cost iron stoves and pipework. Samuel Rutley (Journal of the RAS, 1848) surveyed the options and concluded that he was not able to say which was best; it was a matter of personal fancy. 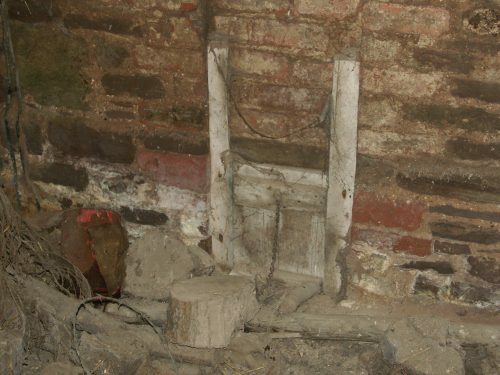 The open hearth fire of charcoal or smokeless coal remained common in the 19th Century. The best charcoal was made out of chestnut and kept for one month to settle to the right level of humidity before being burnt. Writers recommend the a metal plate placed above the hearth, known as a spark plate, and also called a Horse or Hog (see diagram below). This dispersed the heat and prevented sparks rising to the drying hops. 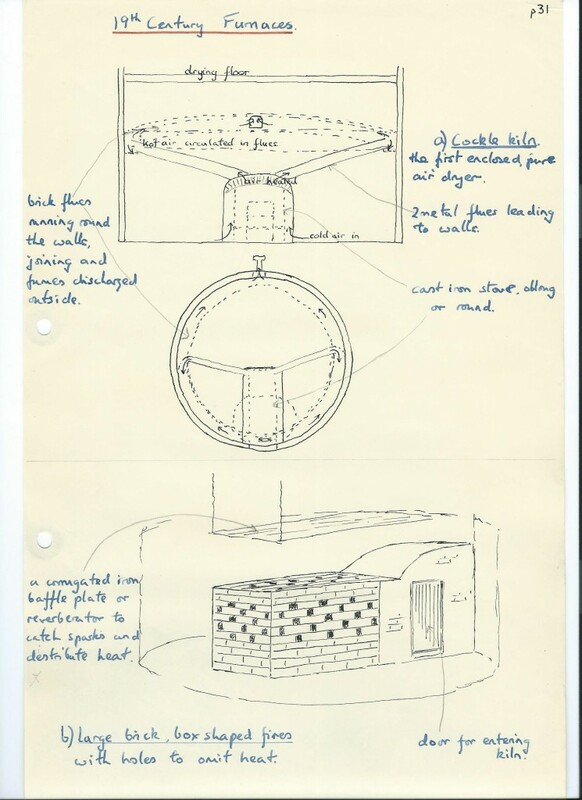 While a simple roundal had just one hearth, larger kilns had 2, 4 or even 6 hearths to spread the heat. 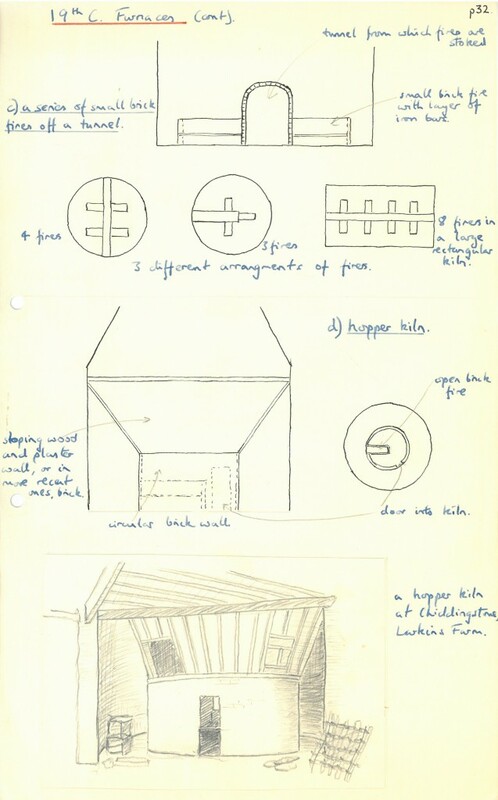 Sometimes these branched off a brick tunnel running across the kiln, enabling the fires to be maintained without direct exposure to the heat (see diagram). 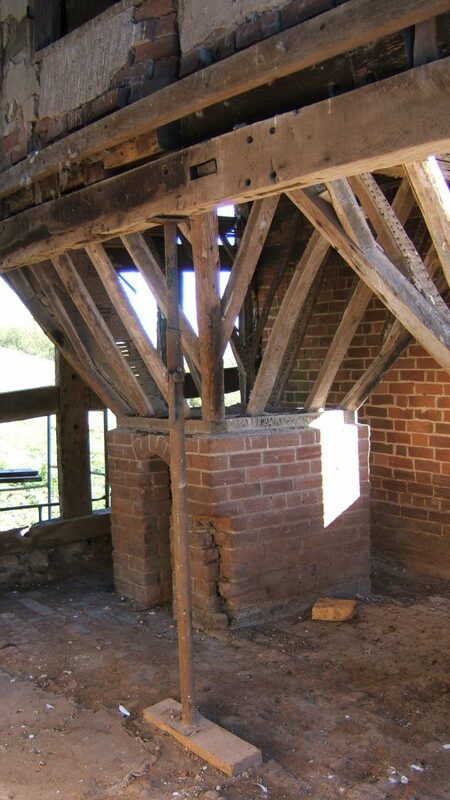 One example which can be seen today is at Great Dixter, East Sussex where the interior has been well preserved. What is surprising is that this was built as late as the 1890s and that the fireplaces were so small – only about 12 inches by 18 inches long. It is hard to believe that they could have generated enough heat. More sophisticated alternative heating systems appeared on the market and took hold. 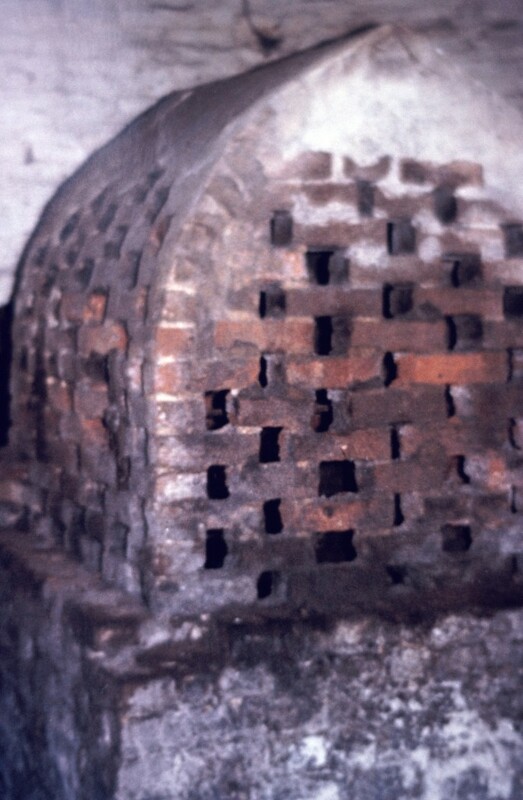 A Cockle stove was made of cast iron with ribs to increase the heating of surrounding air. It took its name from the patterning on the domed top of furnace which looked like overlapping cockle shells. Multiple cast iron pipes vented fumes from the fire and spread the heat – see diagram.One model was the Weeks “Pure Air” plant. Another model was the Shew Patent Economic Pure Air Heater made by Jones &Attwood, Stourbridge, Worcestershire. Drake and Fletcher of Maidstone manufactured of another well known drying plant with zig zaggng pipes. 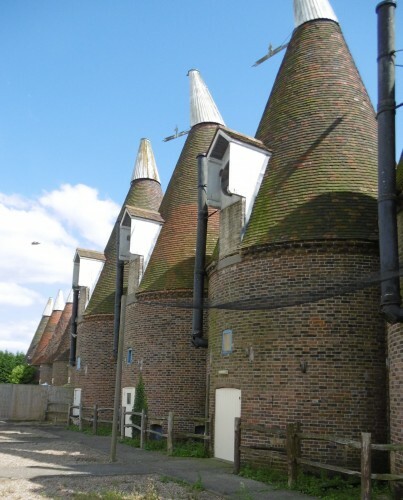 Arnold and Sons of East Peckham SW of Maidstone made the Steam Hop Drying Plant. Later came the Sirocco System by Davidson and Co, Belfast with fan driving warm air from a heater in an adjoining shed. All these systems could use cheaper sea coal because there was no contamination of the hops on the drying floor. Open furnaces had to burn more expensive smokeless fuel such as welsh anthracite brought by rail and barge, if contamination was to be avoided. 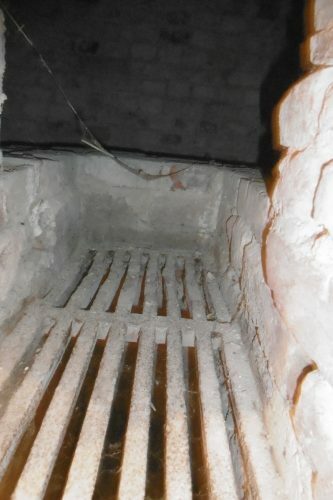 Hopper kiln at Lower Elmores Farm, Knightwick, Herefordshire. 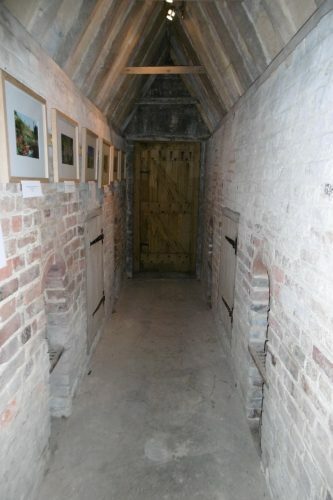 Photo taken during conversion construction work by Jennifer Weale, Bromyard History Society. Draught management was a crucial part of getting the temperature and drying process right. Nearly all kilns had some kind of draught holes near the ground. 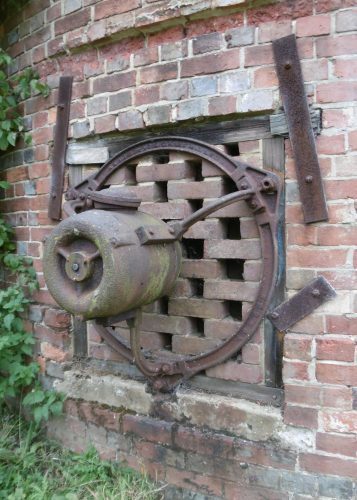 From simple flap controlled vents they developed into mechanised blowers by the end of the 19th Century.